Space is available in Nature Preschool for the 2018-19 school year! Chippewa Nature Center is pleased to offer a nature-based preschool, one of only about 20 others in the country when it first began in 2007. Classes take place in the LEED Gold Certified Margaret Ann (Ranny) Riecker Nature Preschool Center and in the Alden B. Dow-designed Nature Study Building. Nature Preschool offers 3- and 4-year old children a high quality learning environment that meets their developmental needs while initiating them into a life-long, meaningful relationship with the natural world. Nature Preschool offers discovery-based learning through play, sensory, gross and fine motor activities and creative expression, using the natural world as a catalyst for children’s growth and development. The curriculum includes art, music, social and cognitive skill development and natural science exploration. 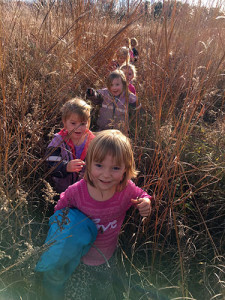 The children regularly hike to wooded areas, ponds, fields and the Homestead Farm. 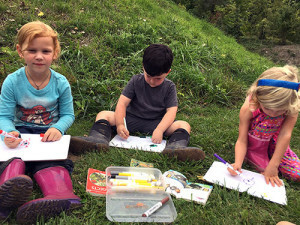 Children build their knowledge through their first-hand experiences with nature, classroom materials and their relationships with peers and adults. Please direct questions regarding Nature Preschool to Madison Powell, Nature Preschool Director. Nature Preschool has consistently earned a 5-star rating, the highest rating possible, on the Michigan Great Start to Quality rating system, effective 2016-18. Of 122 childcare providers in Midland County, only three have received a 5-star rating. Great Start to Quality helps parents find the best early learning settings for their children, and helps providers and educators improve the care they give to children. Providers are evaluated on a 5-star rating system that covers five key areas of quality which include: staff qualifications and professional development, family and community partnerships, administration and management, environment, and curriculum and instruction. Visit greatstarttoquality.org to learn more about the rating system. This four-day workshop will provide preschool educators the information and skills to incorporate nature-based concepts into daily preschool routines while maintaining the integrity of their best practice curriculum. Our mission is to connect all people with nature through educational, recreational and cultural experiences.